With the summer now over, the large feline had a better chance to catch fresh prey. The creature lurked along the neutral lands most of her days, and she would watch as the pack wolves would take down the prey she wanted, no needed, the most. Snarls and growls escaped from her onyx lips, but hushed she was to the outer world. Nobody would know she was around unless they saw her. She blended in with her surroundings, staying low to the ground as she watched in silence. Time and time again the wolves had taken her targeted kill. Not today. She had heard their conversations, eaves dropping on their secrets of pack life. She nodded to herself as she found the need to enter their lands. Oh yes, she would go into the pack territory and get the meal that she truly deserved. How hard could it be to sneak past the feeble-minded canines and steal what was rightfully hers? Slinking towards the border of Helidos, the pack to the west, she made her way through the trees. She could smell the foul scent of dogs and knew she was in the right place. The other packs would be too far a journey for her. So this would have to do. Rumor spread through the forest that Helidos had lost the most Alphas ever, and this only proved just how weak they were. The puma slowly took each cautious step, always on alert. Right as she crossed into pack lands, her hind paw stepped on a fallen branch and snapped it instantly in half. If any wolves were nearby, surely they would have heard the sound. If it were a lone wolf, it would be no problem. Location : Where Rose and Faith are! Thunder found himself walking along the borders more and more often these days, unable to stand the tense and uneasy atmosphere. The pack camp had an awful and toxic aura in the air, as if the depression and grief had poisoned everything nearby. It weighed heavy on the Elder’s shoulders, for he knew not how to help his Alpha and packmates. Emilia and Crystal had disappeared, much to his disappointment. It concerned him, for there was nothing to give him any idea as to what happened to the two faes. Hopefully they are safe…I wish I could have kept my family safe. He thought sadly. His paws carried him closer to the border, his blue orbs scanned the border as he mused about his past and his pack. The cream colored male was just about ready to turn back when there was the sound of a snapping twig or branch. His eyes narrowed as he swung towards the unseen presence, his muscles tensed and senses alert. “Who goes there? State your business.” He barked. The Elder was not a high rank, but he would defend his pack and it’s borders just the same. He waited a moment, carefully watching for signs of movement before stepping towards the noise. 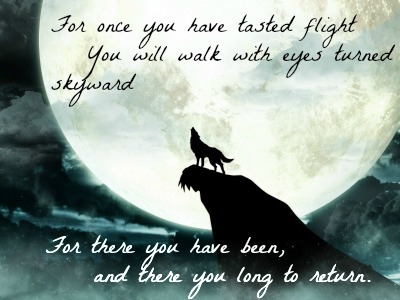 Any polite wolf should have howled to announce their presence or at least spoken once he had come towards them. 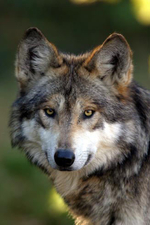 Something wasn’t right, and it made his pelt spike slightly and his lips to curl into a hint of a snarl. Then he saw it. An area of short tawny fur behind some of the underbrush. The color had no variations, nor any other color mixed in. The brute could not smell any other wolves. His mind buzzed with alarm and his eyes searched the small spaces between leaves and branches, searching for the face of the feline. He had encountered them before, although never alone. “You… You’re not welcome here.” Thunder growled menacingly. His eyes darkening like water of a lake on a stormy day. The canid’s body remain tensed, his tail now resting against his flank, but his ears were not yet pressed against his head. He would not be surprised if the cat attacked. His goal was to keep it away from his packmates. He would not let this beast into his home. He walks. He talks. He thinks. "Dying is easy, living is harder." Quote from "Right Hand Man" in Hamilton the musical. The large feline was soon joined by a single wolf. She sniffed the territory around her. No signs of others near him. His stench was intolerable. But she looked to his muzzle, to his paws, and his body. He was old. She smiled a wicked grin. Her tail whipped behind her gracefully, left to right. She stood tall now, now that she had been found by the creature. She allowed a small chuckle to come from her lips. "Well well well... What have we here? A lone little wolf trying to stop me?" She laughed louder than before. "You see, canine... I am allowed to do and go where and when I please. I am able to do anything my mind allows me to think possible. If I want to come into your stupid lands, I will. If I want to steal every kill your pack makes, I will. If I want to systematically kill every single member of your pack, I will. And there's not anything you can do to stop me." She moved closer to the wolf, inspecting him as she stood her ground. She licked her lips as she started to walk in a slow circle around the wolf. Her silver eyes stayed on his form, watching and waiting for some sort of retaliation. But even before the wolf could do anything, she jumped onto his back and dug her claws into his neck. She could feel the blood seeping from his body. No longer did she need food. She had found the perfect thing to make her feel better. Killing was fun. "Go ahead and tell your pack about this... Oh wait, you will probably bleed out and die before anyone finds you." She allowed his body to drop to the ground. She unhooked her claws and moved from him. Back towards the neutral lands she went. Maybe another time she would be able to steal their food. But for now she was content. She immediately raced from the area, hoping the struggle did not arouse some suspicion from the other wolves. Attack: Clings onto the back of the wolf. Her claws went into his neck. Wandering the border of the pack, Azul had kept to his mind about the words Fel had spoken to him. He was angered by her. There was no way that any of those lies were true. Sitka and Helidos did not need a Rogue and his stupid pack. He growled to himself as he made sure to mark as much of the land as his old bladder could handle. He moved quicker than normal, as if he had something to prove to himself or to others around him. He held his head high and in an instant, attacked a tree. Anger flowed through him and he could not control his own behavior. This was not the wolf he knew himself as, but there was no stopping it. He broke a limb off the tree itself and chewed on it until it was in a ton of tiny pieces. He could feel some stress leaving his body, but there was still a void. A lot of his friends had been lost most recently. Quinn, Fenris, Rose, Nnlya, and even Juno. He had been closest to Juno and Quinn, but still so many had been lost either to death or just losing everything which was of value to them. 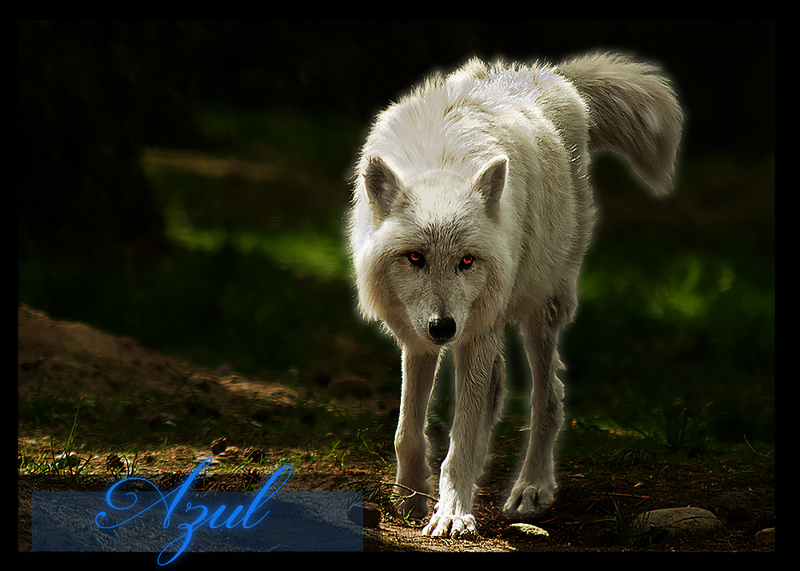 With the branch now destroyed, Azul could hear there was peace in the forest. His eyes moved to the neutral lands, and he heard a strange sound. His ears were alert atop his head. His eyes moved along the grass and brush to see if there was something nearby. There was a disturbance as the sound of leaves and branches were snapped in some sort of struggle. Nobody was going to come into his lands. Now more than ever, he was ready to take on an opponent. He snarled as he rushed forward. The aches and pains swelled in his joints. But he had to keep moving. He was determined to do it. In the blink of an eye, he saw a blur or cream and tan rush off from the borders. Azul thought to chase the fleeing bandit, but instead, he smelled something he was very familiar with. Blood. He moved towards the blood only to see an elder like himself. Thunder. His heart sank in his chest as he moved to see the downed wolf. "Thunder, my word... what has happened to you?" It was a rhetorical question, for he figured out the whole scene on his own. The puma had probably thought it killed the wolf, and left him here, but really Thunder was still pushing on. "Don't speak, conserve your energy.. I can try and get help." Azul moved to his side and laid down beside him. He tried to see if there was anything he could do. 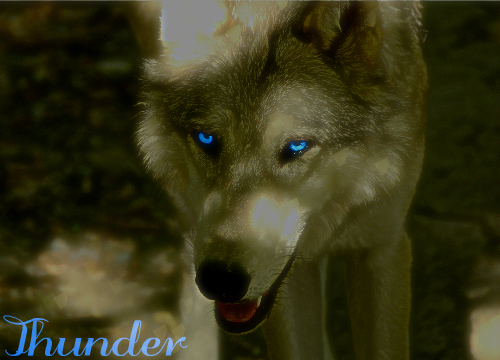 He howled out to the pack, calling for anyone to come and find them, to help Thunder. He needed it more than ever now. His howl was long and drawn out, but he had to try hard. When the song ended, he lowered his head and nuzzled Thunder's cheek affectionately. "I am here for you friend, and I will not leave your side." Aimless trotting indiscriminately seemed to have been somthing Abyss had picked up ever since the fire. A plethora of thoughts diversified in an assorted motley, unable to be differentiated, one from the other. That, the fae decided, was very similar to insanity. Despite awareness of a rather paradoxical fact, an apparent decision had been taken that she was fine with it. A long drawn howl caught her ears in one of these moments - a thankful turn of fate, for she almost certainly wouldn't have heard it in her musing. Her thoughts were too loud for that, but this time, she couldn't stop to ponder over the puzzling call. The urgency in it made the fae hurry towards the source. Of course, the relatively new member was taking a risk. She did not know who was calling, and it was the border after all. What if it was a wolf seeking acceptance, much like she had been some time ago? What if it was an aggressive being? No matter, the truth would become evident a few paces away. The reality she faced was harsh. Two silhouettes stood out in contrast against the dark fringed foliage. The one standing over the other was unfamiliar to her, with a snowy white pelt and a rather harassed look about him. His manner spoke of his rank, an Elder. But the wolf lying prone on the ground was one she knew. Her heart skipped a beat. Thunder. Unmindful of the fact that she should probably approach with respect, the young fae hurried closer. Her golden oculars flashed in worry, and her maw was parted slightly, but her advance was arrested in mid-flight. The stench of blood had struck her like a physical barrier, and her jaws parted further in shock. Her midn jumped to an immediate, and she knew it to be, irrational conclusion. Who was this unknown wolf who shared Thunder's rank? Was he a Helidos wolf? She had never seen him before, and bristling slightly, she wondered if he had been the one to hurt him. Her further approach was of a brash demeanor, and she was rather fluffed up in an attempt to look intimidating, but all she ended up impressing was that she was frazzled. She watched the Elder's head lower to Thunders', and her breath caught. Her heart and pace both quickened. But it was reassuring words that fell on her ears. "I am here for you friend, and I will not leave your side." Abyss visibly relaxed, although her gait did not slow, as the upright brute nuzzled the graying canid's cheek. Words swelled in her chest, but were withheld. Her parted lips trembled, in fact, her whole being trembled, as she approached the terrible scene. The Elder she knew and remembered - a quiet, dignified canid remained in her memory. What had happened here? She had missed the flash of tawny fur as the puma retreated, and so it left her puzzled to the source of the injuries. Finally coming to a pattering halt beside the inert elder's head, emotions permeated through to her quivering voice, giving way to an explosive bark. "Thunder!" The beast was cunning, and it spoke with a smooth tongue, much to the brute’s disgust. How dare she! A threatening snarl rumbled deep in his chest as he bared his fangs. “You’ll do nothing of the sort!” Yet the male new better than to charge the cat head-on. He new better than to fight it before he could call in back up. Blue eyes watched the intruder carefully, never leaving her tawny pelt for a moment. The Elder’s mind screamed at him to flee, to find safety in numbers, with his pack. His senses were tuned into the danger that now faced him with a wicked grin. He warily kept his form turning to remain facing her as she circled him. The wolf was painfully aware of his aging body, and how unprepared he was for this encounter. He tensed, waiting to see what move she would make. It happened in a flash and a slash and hook of razor sharp claws. The old wolf didn’t even have the chance to react, not even to howl for help. All he could do was grunt with surprise as the feline’s deadly grip held onto his back, her weight knocking the wind out of him. For a moment everything seemed unreal and time seem to slow as he felt claws sink deep into his neck. The blood, oh he could feel it running down his sides already. He could feel it trickling into his fur and onto the ground. The cream and grey brute crumpled gracelessly beneath the weight and pain of the wild cat on his back. He was dully aware of the words of the beast as he hit the ground, and a sense of failure washed over him. I’m sorry my friends. I couldn’t fight off the damn puma... I’m too old. Thunder thought guiltily as a haze of pain settled over his mind. The moment the cat had stepped away from the Elder’s body, he could feel his life draining away as the blood seeped from his wounds. He knew not which direction the cat had run off too, but he soon heard another voice. Azul? The male attempted to turn his head slightly, despite knowing it would not help his condition. He grimaced and grunted a bit, well aware that he must have been a dreadful sight to behold. Dull blue eyes filled with worry as the white wolf came into view. Was the beast still around "Puma…it…it jumped me. I’m sorry. I...I don’t know where it went.” He wheezed. The crimson liquid coming from his neck made it difficult to speak. Thunder let his head rest on the ground, knowing there was no point in keeping it lifted. Much to his dismay, the ex-alpha howled for help, attempting to summon more of their packmates. There seemed to be a bit of desperation in the way Azul spoke, and yet the wounded male knew there was nothing that could be done. "No…..Azul. It’s…it’s too late. It would be a waste of resources trying to fix…this.” The creamy brute rasped quietly with a flick of his tail towards his wounds. By now he could feel the blood soaking his fur. The fallen canid let out a spluttering cough. A small bit of surprise sparked inside the brute as the other male seemed suddenly so caring, as if they had always been the best of friends. Although it seemed strange to Thunder, he accepted it with a slight smile. “Thank you,” he whispered. “I…I’m proud… to be your packmate. Rose...she was happy here…with Sitka, with you and the pack. I…I found her. I found my family…… my home.” His breath became more labored, but he fought it, smiling weakly with real happiness as he thought of his two sisters. “Sitka…tell Sitka that…that I’m proud. My brother…he has stayed strong. I admire that.” He coughed as his tail twitched in an attempt to wag it for a moment. His eyes clouded wistfully. "The only things I wish was... that I had gotten to spend more time with him, and…and that Rose had stayed with us longer.” He added, trying hard to ignore the blood which still trickled from his wounds.